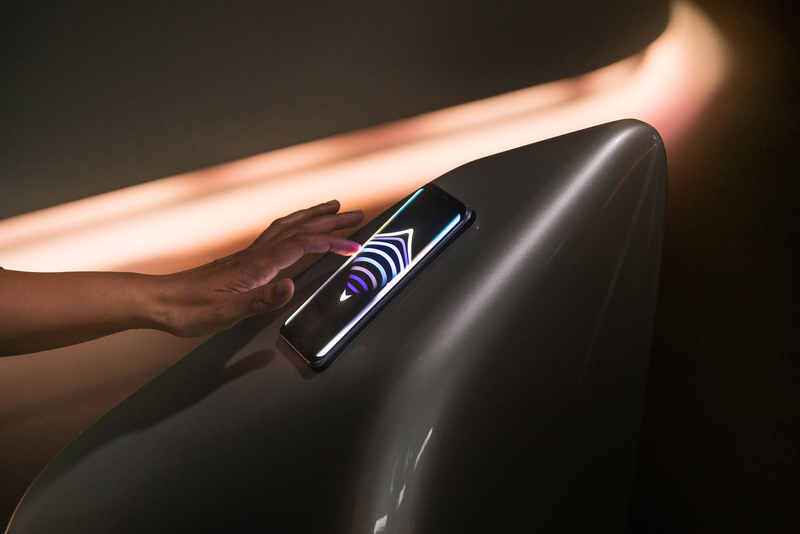 Unconfined was an immersive, interactive installation open during Milan Design Week 2017, inspired by the new Samsung Galaxy design. 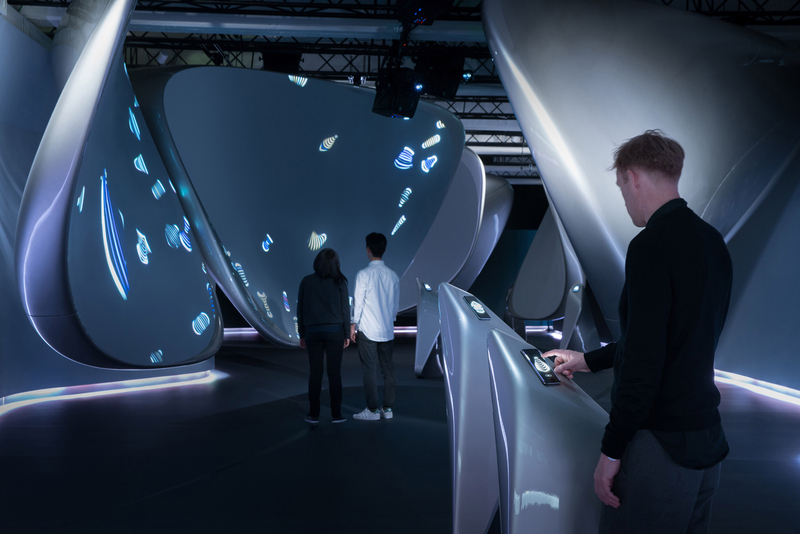 Together, Universal Everything and the bold, forward-looking studio of the late Zaha Hadid explore the infinite possibilities created when design and technology are seamlessly unified. 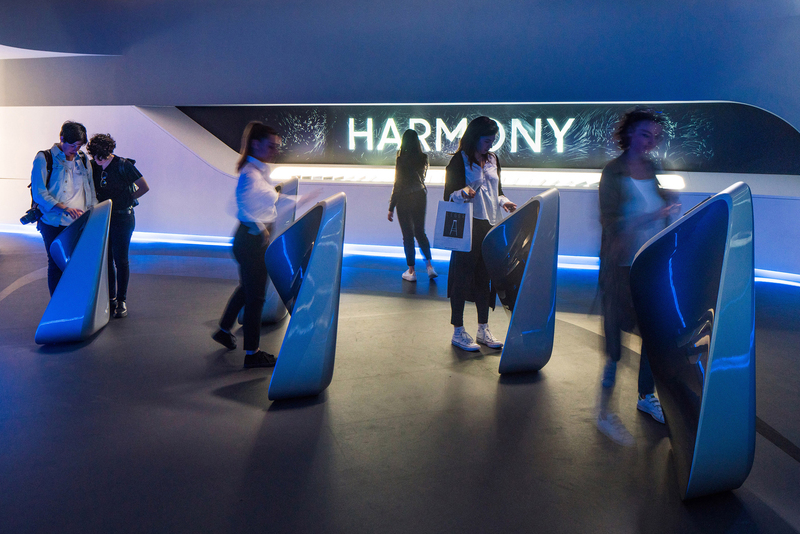 Visitors are invited to journey through the installation, creating mesmerising digital installations and bringing to life the Galaxy design philosophy of “no borders, no boundaries”. Matt Pyke is a UK based artist and designer. He is director and founder of Universal Everything, a digital art and design studio inventing new forms of moving image for the screens of the future. 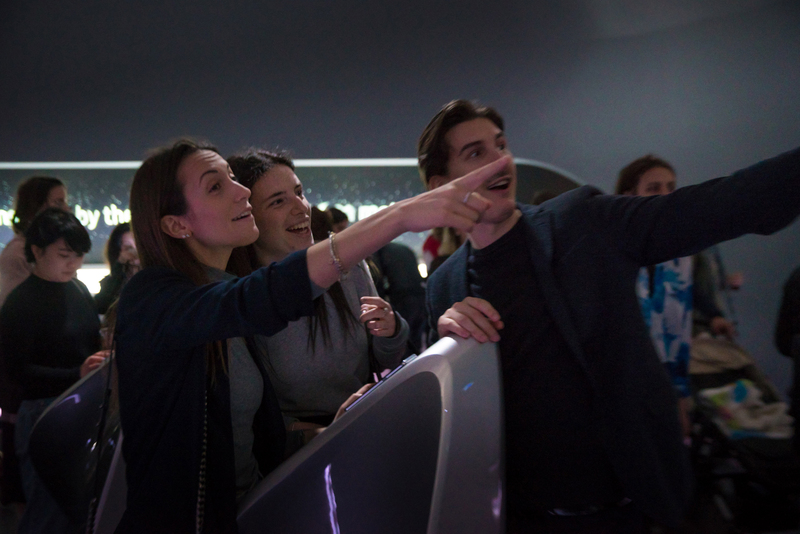 Universal Everything’s approach combines humanity and technology to stimulate emotions, sensations and participation. The studio’s artworks and commissions are often multi-sensory experiences, using video, sound, light, architecture and interaction. They embrace emerging formats, like 3D printing, touch screens, motion capture and large format video. Matt has directed commissions for visionary people and organisations including Samsung, IBM, Chanel, Intel, Nike, Hyundai, Deutsche Bank, and Radiohead. Work by Matt Pyke and Universal Everything has been exhibited worldwide, at the likes of MOMA (New York), V&A Museum (London), Central Academy of Fine Arts (Beijing), Garage Centre for Contemporary Culture (Moscow), La Gaité Lyrique (Paris), and Art HK (Hong Kong). Digital Creatures (Creature Digitali) is curated by ArtFutura founder and director Montxo Algora and produced by MondoMostre Skira. The exhibition showcases artists who are redefining creativity in an increasingly digital world. Universal Everything is exhibiting 12 videos from its ongoing series Screens of the Future, alongside works by Paul Friedlander (UK), Esteban Diácono (Argentina), Can Buyukberber (USA), Sachiko Kodama (Japan), Chico MacMurtrie/Amorphic Robot Works (USA), and more. Borusan Contemporary Art Collection holds the following Universal Everything artworks in its permanent collection: Supreme Believers, Communion, Presence, 1000 Hands, Screens of the Future – Prototypes 1 to 5. A solo show of five new video artworks by Universal Everything, exploring human form, perception, behaviour and movement: Mass, Closer, Disciples, OpClock, Screens of the Future. An exhibition of Universal Everything video works shown across various spaces within Sydney Opera House to coincide with the Living Mural commission, shown as part of Vivid 2015. Artworks: Presence, Walking City, Transfiguration, Everywhere, Flow. A collaboration between Universal Everything and the audience, exploring methods of generative design. A bespoke app presents the audience with a limited shape and colour palette, encouraging them to create short animated loops in response – as simple as drawing on paper. Their contributions are shown in a gallery of multiple works looping concurrently, creating a wall of individual animations that are a collective response to the aesthetics and rule-based limitations presented to them. A solo show from Universal Everything exploring abstraction, anthropomorphism, transfiguration and the essence of the human form. "Taken collectively, their body of work is a study of our most primal emotional triggers—the power of moving images and sound to produce profound synaesthetic experiences; the quest to distill life into its most fundamental, abstract forms; the celebration of gesture, human movement and the beautiful simplicity of the drawn line." – Julia Kaganskiy. A solo show exploring the limits of abstract representation. Working with a Tai Chi dancer and using motion capture and 3D modelling technologies, Universal Everything create fragmented digital sculptures that maintain the suggestion of the human body while distilling it to its simplest forms. A major solo exhibition of 8 installations from Universal Everything: Communion, The Transfiguration, Supreme Believers, Voxel Posse, Electric Trees, 76 Seeds, Everywhere, You / Me. A solo show from Universal Everything for Air France, of artworks The Transfiguration and Supreme Believers. A monolithic digital sculpture commissioned for the museum's courtyard, Universal Everything's Forever explores impermanence and the ephemeral notions of time. Composed with bespoke generative software that powers both the visuals and the soundtrack, Forever is always changing and offers a never-ending stream of forms, compositions, and variations that disappear as quickly as they appear.